The morning started with howler monkeys, whose actual howls grew louder as they got closer and closer, around dawn. You hiked through a bamboo grove, around the roots of huge fig trees, and by hundreds of colorful butterflies. You saw one capped heron—with its bright blue beak—chase another high into a Brazil nut tree, the snake-like neck of an anhinga as it fished in the water, and a small troop of white-cheeked spider monkeys grazing on fruit as you paddled a canoe up the Cristalino River. Then you watched tiny tanagers, long-tailed macaws, patterned aracaris, and even a harpy eagle from a 145-foot observation tower. It’s been a pretty exciting day. Now you’re heading back to your wooden bungalow for some downtime before dinner. You can already see the wooden benches on its veranda up ahead. Inside, it feels like a secluded retreat. It has a cool ceramic-tile floor, oversized windows with stainless-steel screens, and lots of natural wood. A king-size bed and comfortable armchairs are in the main room. The bathroom has three sections, including an external shower along the private garden. 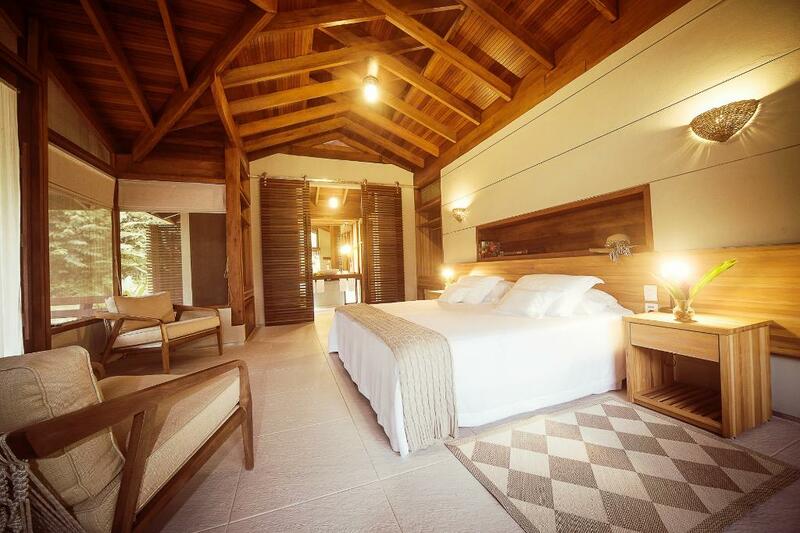 Plus a natural ventilation system and solar water heating live up to the lodge’s promises of eco-friendly practices. This rustic-chic hideaway is one of 18 bungalows at the Cristalino Lodge. It’s part of a large (bigger than Manhattan) private forest reserve north of Alta Floresta in Central-West Brazil. The High Forest is one of the southernmost sections of the Amazon. It’s usually hot, humid, and rainy here. That’s why you were able to see so many fascinating animals and plants today. After scrolling through tons of photos on your phone and taking an outdoor shower, you head back to the main lodge for a cocktail before dinner. 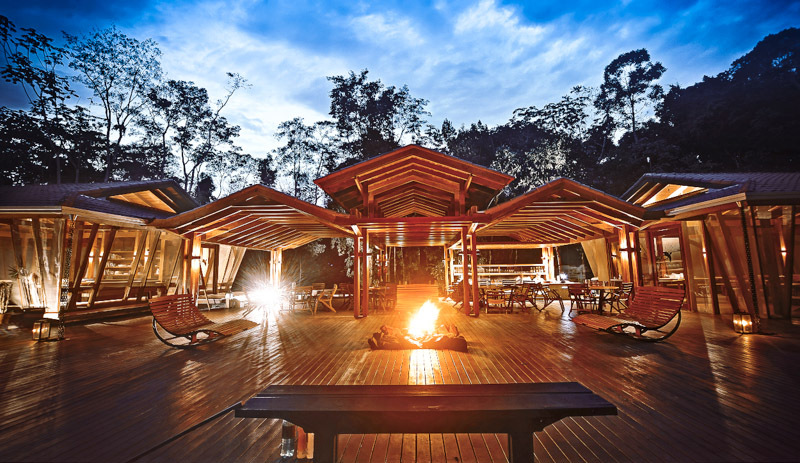 Its open-air bar overlooks sculpted rock formations at the edge of the jungle. Double wooden rocking chairs, a crackling fire pit, and lots of white candles are set up on the terrace. You order a caipirinha, made with Brazilian white rum and lime, and then decide to take your drink down to the floating deck. Wooden walkways lead down to the river and out to the deck. More rocking chairs, sun loungers, and umbrellas overlook the calm water. You opt for an overwater hammock instead of a rocking chair by a smaller fire pit. You’re hoping to see a giant otter, before the sky is completely black, if you stay perfectly still. A candlelight dinner, complete with regional Brazilian dishes and South American wines, will eventually follow. As long as another interesting animal doesn’t make an appearance that is.